Baby undersocks are a one piece undergarment with socks attached. Created by a mother of four, Christine was hoping to solve the problem of children pulling their socks off and the issue that probably troubles us all, exposed ankles. I definitely have thought to myself on several occasions that there has got to be something out there to help keep my babies warm and cozy. My little ones have all pulled their socks off, especially in the car and of course they never keep their blanket on their legs to cover those exposed ankles that you get from strapping them into the car seat. Likewise, in bed my little guy plucks his socks off as fast as he can, falls asleep and then wakes up crying because his little tootsies are cold from our old drafty house. Baby undersocks are made with a bamboo thermal fabric, designed to keep baby warm, wick away moisture, it is breathable and a natural antibacterial. Bamboo fabric is smooth and soft against that sensitive baby skin. A feature I loved is that they are skid free and so comfy to wear. I just slip them on so he can wear them alone or under clothing. They stay on, period! 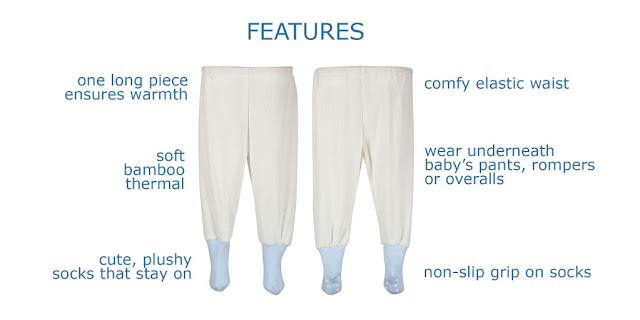 Baby Undersocks come in 3 different colors (pink, white, and blue) and 5 sizes (0-3, 3-6, 6-9, 9-12, 12-18). You can now purchase Baby Undersocks for $19.95. Keep your baby warm with Baby Undersocks! Use code peace20 for 20% off your order. Look for larger sizes and different colors someday in the future, a little birdie told me!